Do you find yourself ignoring dirt on ceiling fans and blinds, hoping it will just go away? Our Springs luxury apartment homes come with both of these desirable features, and we've discovered they're not as difficult to clean as you might think. We've put together a list of our favorite tips to keep your ceiling fans and blinds looking like new. An old pillowcase makes a perfect duster for ceiling fans. Spray the inside of the pillowcase with a mixture of water and vinegar and place it over one of the blades. Hold the open end closed as you gently slide the pillowcase down the length of the blade, trapping the dust inside. Toss the dirty pillowcase in the wash for reuse. A microfiber duster is another good option. The fibers trap the dust particles, and some models come in a curved design that lets you clean both sides of the blades at once. Extenders are available to extend the reach so you don't even need a stepladder. Make a DIY version of the microfiber duster by using rubber bands to fasten a dryer sheet around a paint roller, then attach the roller to a pole or extension handle. The dryer sheet will grab and hold the dust just like the microfiber does. For light everyday cleaning, a feather duster works well. Simply run it back and forth between the slats. You can also use the hose or brush attachment of your vacuum cleaner for quick dusting or preparation for more in-depth cleaning. 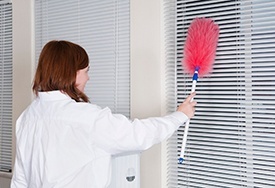 Close the blinds and run the attachment over them, then reverse the blinds to clean the other side. Use an old sock or glove for more thorough cleaning. Slip it over your hand and spray the blinds, one section at a time, with Windex or a solution of vinegar and water. Run your hand over each slat, using a pinching motion to pick up all the dirt. Do you have any clever tips for some of the more awkward cleaning chores? Share them with us in the comments!